As chemicals are widely used for snow and ice control of highway and airfield pavements or aircrafts, recent years have seen increased concerns over their potentially detrimental effects on the surrounding environment. The abrasives used for winter operations on pavements are also a cause of environmental concerns. 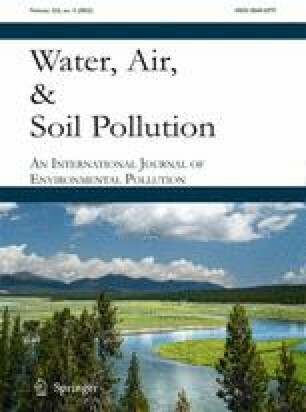 After some background information, this paper presents a review of the environmental impacts of chemicals used for snow and ice control, including those on: surface, ground, and drinking waters; soil; flora; and fauna. The paper provides a state-of-the-art survey of published work (with a focus on those in the last two decades) and examines mainly the impacts of abrasives, chlorides, acetates and formates, urea, glycols, and agro-based deicers. Finally, we conclude with a brief discussion of public perception of such impacts and best management practices (BMPs) to mitigate them. The online version of this article (doi: 10.1007/s11270-011-1064-6) contains supplementary material, which is available to authorized users. The authors acknowledge the financial support by the Colorado Department of Transportation (CDOT) and the U.S. DOT Research and Innovative Technology Administration that made this work possible. We appreciate the guidance and insights provided by the CDOT project manager and technical panel members for the alternative deicer evaluation project, which contains the work presented herein as an integral component. We are also thankful for the assistance provided by our former colleague Marijean M. Peterson in editing this manuscript. Environment Canada, (2010). Risk management strategy for road salts, http://www.ec.gc.ca/nopp/roadsalt/reports/en/rms.cfm, last accessed on February 8, 2010. EPA, (2006a). 2000 national water quality inventory. U.S. environmental protection agency. http://www.epa.gov/305b/2000report/, last accessed on February 5, 2010. EPA, 2006b. Secondary drinking water regulations: guidance for nuisance chemicals. U.S. Environmental Protection Agency. http://www.epa.gov/safewater/consumer/2ndstandards.html, last accessed on February 5, 2010. EPA, (2010). Environmental protection agency, U.S. environmental protection agency. http://www.epa.gov/ogwdw000/ccl/sodium.html, last accessed on February 8, 2010. Johnson, J. J., Varney, N., Switzenbaum, H. S., (2001). Comparative toxicity of formulated glycol deicers and pure ethylene and propylene glycol. Water Resource Research Center, University of Massachusetts at Amherst. http://www.umass.edu/tei/wrrc/WRRC2004/pdf/no.174.pdf#search=%22enviornmental%2C%20glycol%20deicer%22, last accessed on January 22, 2010. Keating, J., (2001). De-icing salt, still on the table. Stormwater. 2(4). http://www.stormh2o.com/may-june-2001/sodium-chloride-salt.aspx, last accessed on January 20, 2010. Mericas, D., Ajello, T. B., Lengel Jr., J. A., Longsworth, J., (2009). Deicing planning guidelines and practices for stormwater management systems. ACRP Report 14. Transportation Research Board, Washington, D.C. http://onlinepubs.trb.org/onlinepubs/acrp/acrp_rpt_014.pdf, last accessed on February 15, 2010. Pacific Northwest Snowfighters Association, (2006). Snow and ice chemical product specifications and test protocols for the PNS Association of British Columbia, Idaho, Montana, Oregon, and Washington. http://www.wsdot.wa.gov/partners/pns/pdf/4-06FinalPNSSPECS.pdf, last accessed on February 5, 2010. PNSA. (2010). Pacific Northwest Snow Fighters (PNS) Qualified product list. http://www.wsdot.wa.gov/partners/pns/pdf/PNSQPL.pdf, last accessed on February 8, 2010. Public Sector Consultants, (1993). The use of selected de-icing materials on Michigan roads: environmental and economic impacts. Prepared for the Michigan Department of Transportation. http://www.michigan.gov/mdot/0,1607,7-151-9622_11045-57246--,00.html, last accessed on January 19, 2010. Ritter, S., (2001). What is that stuff? Aircraft deicers. CENEAR, 79(1), 30. http://pubs.acs.org/cen/whatstuff/stuff/7901scit5.html, last accessed on January 20, 2010. Schulte, E. E., Kelling, K. A., (2004). Understanding plant nutrients: soil and applied calcium (A2523) (http://www.soils.wisc.edu/extension/pubs/A2523.pdf), soil and applied magnesium (A2524) (http://www.soils.wisc.edu/extension/pubs/A2524.pdf), soil and applied potassium (A2521) (http://www.soils.wisc.edu/extension/pubs/A2521.pdf); last accessed on January 20, 2010. Staples, J. M., Gamradt, L., Stein, O., Shi, X., (2004). Recommendations for winter traction materials management on roadways adjacent to bodies of water. Montana Department of Transportation. FHWA/MT-04-008/8117-19. http://www.mdt.mt.gov/research/docs/research_proj/traction/final_report.pdf, last accessed on Dec. 5, 2009. Transportation Association of Canada, (2004). www.tac-atc.ca, last accessed on December 5, 2009. U.S. Navy. Substitution and Recycling of Air Craft Deicing Products. http://www.p2pays.org/ref/20/19926/P2_Opportunity_Handbook/6_I_7.html, last accessed on February 9, 2010. Warrington, P. D., (1998). Roadsalt and winter maintenance for British Columbia municipalities: best management practices to protect water quality. Ministry of Water, Land and Air Protection. http://www.env.gov.bc.ca/wat/wq/bmps/roadsalt.html, last accessed on January 19, 2010. Wegner W., Yaggi, M., 2001. Environmental impacts of road salt and alternatives in the New York City Watershed. Stormwater 2(5). http://www.stormh2o.com/july-august-2001/salt-road-environmental-impacts.aspx, last accessed on January 19, 2010. Williams, D., (2001). Past and current practices of winter maintenance at the Montana Department of Transportation (MDT). http://www.mdt.mt.gov/publications/docs/brochures/winter_maint/wintmaint_whitepaper.pdf, last accessed on February 8, 2010.